RICHMOND, Va. – With the inaugural race at Charlotte Motor Speedway’s ROVAL looming on the horizon, Kyle Busch, Martin Truex Jr. and Christopher Bell breathed a sigh of relief following their performances at Richmond Raceway. Busch’s Saturday night victory in the Federated Auto Parts 400 guaranteed him a trip to the Monster Energy Cup Series second round. 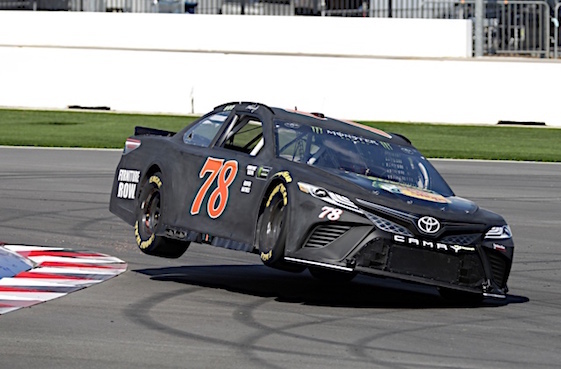 Truex secured a second-round position via points with his third-place finish at the three-quarter-mile track. Bell kicked off the Xfinity Series playoffs Friday night with his victory in the GoBowling 250. For the Cup drivers, the precarious 17-turn, 2.28-mile ROVAL signals the conclusion of the playoffs’ first round and a week of sleepless nights for those still working to advance. “I’m terrified of next week because there are so many unknowns,” Kevin Harvick said after his second-place finish at Richmond. Harvick is third in the standings, but realized how fragile that can be at Las Vegas when he crashed and finished 39th in the Cup playoffs’ opening race. Brad Keselowski won that event to advance to the second round. After Richmond, the bottom four drivers in the standings were Clint Bowyer, Jimmie Johnson, Erik Jones and Denny Hamlin. By short-track standards, Richmond’s Cup race was a tame event. There were only three caution flags for 23 laps and two of them ended the first two stages. Crew chief Adam Stevens believed it was the competitors’ concern for Charlotte’s ROVAL that changed the event’s complexion. “Guys were probably trying to really maximize their day today because there’s going to be a lot of people leave there disappointed next week,” Stevens said. Team owner Joe Gibbs noted his organization wrecked four cars during practice on the new road course. However, there were no worries Saturday night for Busch who won Richmond’s fall race for the first time. After starting in the rear due to repairs that had to be made to his Toyota after he damaged it in qualifying, Busch methodically moved through the field. He had cracked the top 15 by the end of Stage 1and was 11th at the end of Stage 2. He took the lead for the first time on lap 287 of the 400-lap race and held it for 41 laps before engaging in an intense battle with Keselowski. The two exchanged the lead four times over the next 37 laps before Busch took the lead for good on lap 364. He set the pace for the final 37 laps, eventually taking a 0.777-second victory over Harvick. Busch’s 50th career victory tied him on the all-time list with NASCAR Hall of Fame members Ned Jarrett and Junior Johnson. His sixth Richmond victory tied him with David Pearson, Rusty Wallace and Darrell Waltrip. Pearson and Waltrip scored their six victories when the track was a half-mile. Wallace’s six occurred after the track was transformed into a three-quarter-mile facility. (11) Kyle Busch (P), Toyota, 400. (1) Kevin Harvick (P), Ford, 400. (3) Martin Truex Jr. (P), Toyota, 400. (18) Chase Elliott (P), Chevrolet, 400. (6) Aric Almirola (P), Ford, 400. (26) Austin Dillon (P), Chevrolet, 400. (9) Kyle Larson (P), Chevrolet, 400. (21) Jimmie Johnson (P), Chevrolet, 400. (7) Brad Keselowski (P), Ford, 400. (24) Clint Bowyer (P), Ford, 400. (8) Erik Jones (P), Toyota, 400. (13) Alex Bowman (P), Chevrolet, 400. (15) Ricky Stenhouse Jr., Ford, 400. (12) Joey Logano (P), Ford, 399. (16) Ryan Newman, Chevrolet, 399. (2) Denny Hamlin (P), Toyota, 399. (38) Daniel Suarez, Toyota, 399. (5) Kurt Busch (P), Ford, 398. (4) Ryan Blaney (P), Ford, 398. (19) William Byron #, Chevrolet, 398. (14) Jamie McMurray, Chevrolet, 398. (20) Paul Menard, Ford, 397. (40) David Ragan, Ford, 397. (23) Michael McDowell, Ford, 397. (17) Matt Kenseth, Ford, 396. (10) Cole Custer(i), Ford, 396. (25) Bubba Wallace #, Chevrolet, 395. (29) Ty Dillon, Chevrolet, 395. (28) AJ Allmendinger, Chevrolet, 394. (22) Chris Buescher, Chevrolet, 394. (39) Regan Smith, Chevrolet, 394. (31) Corey LaJoie, Chevrolet, 393. (30) Ross Chastain(i), Chevrolet, 392. (27) Matt DiBenedetto, Ford, 391. (35) Joey Gase(i), Chevrolet, 388. (36) * Landon Cassill(i), Chevrolet, 387. (32) * Jeffrey Earnhardt, Toyota, 387. (34) Alon Day, Toyota, 383. (37) * Timmy Hill(i), Toyota, 382. (33) * Gray Gaulding, Ford, Brakes, 289. Average Speed of Race Winner: 103.152 mph. Time of Race: 2 Hrs, 54 Mins, 30 Secs. Margin of Victory: 0.777 Seconds. Caution Flags: 3 for 23 laps. Lap Leaders: K. Harvick (P) 1-40; M. Truex Jr. (P) 41-103; B. Keselowski (P) 104; M. Truex Jr. (P) 105-203; A. Almirola (P) 204; C. Elliott (P) 205-213; B. Keselowski (P) 214-243; C. Elliott (P) 244-268; A. Bowman (P) 269; M. Truex Jr. (P) 270; R. Stenhouse Jr. 271-272; B. Keselowski (P) 273-286; Kyle Busch (P) 287-327; B. Keselowski (P) 328; Kyle Busch (P) 329-342; B. Keselowski (P) 343-363; Kyle Busch (P) 364-400. Leaders Summary (Driver, Times Lead, Laps Led): M. Truex Jr. (P) 3 times for 163 laps; Kyle Busch (P) 3 times for 92 laps; B. Keselowski (P) 5 times for 67 laps; K. Harvick (P) 1 time for 40 laps; C. Elliott (P) 2 times for 34 laps; R. Stenhouse Jr. 1 time for 2 laps; A. Almirola (P) 1 time for 1 lap; A. Bowman (P) 1 time for 1 lap.